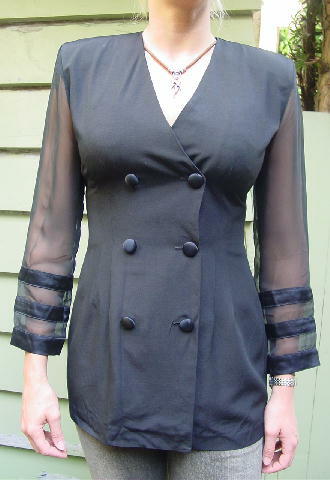 This 60% rayon and 40% acetage black jacket is by Joseph Ribhoff and was made in Canada. 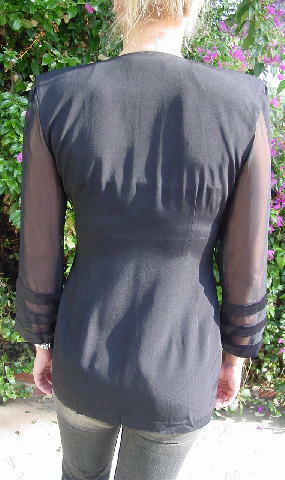 It has shoulder pads and sheer long sleeves which have 3 horizontal black acetate 1 1/8" wide panels. There is a double breasted styling with 6 fabric covered buttons. It has a 8" deep V neckline. shoulder pad to shoulder pad 16 3/4"
bottom hem side to side 19"